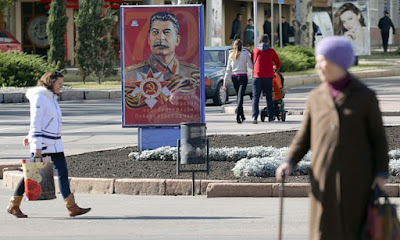 DONETSK, Ukraine -- Soviet Communist nostalgia rules as images of the former dictator go on display in the centre of Donetsk, the rebel capital of eastern Ukraine once called Stalino. One of three Stalin portraits in the centre of Donetsk. Three portraits of the former Soviet dictator Joseph Stalin are on display in the centre of Donetsk, the rebel capital of eastern Ukraine, as the separatist authorities fuel a mood of Soviet Communist nostalgia. The previously taboo display comes as the rebels revive Soviet customs to cement their Moscow-backed rule – while glossing over Stalin’s atrocities. The portraits went down well with one young woman walking past. “I think the portraits of Stalin are a good thing. It’s our history and a lot of people have forgotten he even existed,” said Yekaterina, a 22-year-old student. The horrors of Stalin’s repressions and the deaths of up to ten million Ukrainians in the 1930s due to famine caused by forced collectivisation go unmentioned. The Donetsk rebel leader, Alexander Zakharchenko, said how he regretted the break-up of the Soviet Union. “The Soviet Union was a great country and it was a huge mistake that it was destroyed by the CIA and other secret services,” said the 39-year-old former field commander who prefers to dress in camouflage gear. Stalin portraits have become de rigueur in the offices of rebel officials in eastern Ukraine, where the separatist conflict has killed more than 8,000 people. The Donetsk rebels’ deputy defence minister, Eduard Basurin, wears a badge with Stalin’s profile on his uniform. This new cult of Stalin revives the memories in Donetsk, a coal-mining city that was formerly known as Stalino. It was renamed in the early 1960s after Nikita Khrushchev, who emerged as Soviet leader in the power struggle that followed Stalin’s death, condemned his predecessor’s cult of personality. Such reverence for Stalin contrasts with the attitude of Kiev’s pro-western government, which in May passed laws making it illegal to display Soviet symbols, as it does Nazi swastikas. The law calls for the pulling down of monuments as well as renaming of streets, towns and enterprises that carry Soviet names. Across Ukraine, the authorities have already pulled down numerous statues of Lenin, much to the rebel leaders’ disgust. The Donetsk rebels’ culture minister, Alexander Paretsky, condemned “vandalism and barbarism” while the leader of the Luhansk rebel region, Igor Plotnitsky, warned of a “moral genocide”. In the town of Novoazovsk on the Azov sea, the rebels ceremonially restored a Lenin statue to its pedestal after taking control from Ukrainian forces. In forging a new identity for the separatist region, the rebels have largely turned to the Soviet past. Their territories are called “people’s republics”, echoing the Soviet-era names of Communist satellites such as Bulgaria, Mongolia and Romania. Luhansk People’s Republic has a new emblem featuring sheafs of corn and a red star, like those of the USSR’s republics. The rebels are even attempting to revive the Soviet-era Young Pioneer youth group, a kind of socialist Scouts. In a more sinister move, the rebels named their security organ the Ministry of State Security or MGB, the same as Stalin’s secret police from 1946 to 1953. Their justice system is also modelled on the Soviet system, where the defendant had little chance of acquittal. “It’s the Soviet model of the prosecutor’s office that we adopted in Donetsk,” said Andrei Spivak, the official charged with overhauling the system. Also in Donetsk, an exhibition of paintings pays tribute to Soviet hero “shock worker” Alexei Stakhanov, who achieved record coal production levels at a mine in the Luhansk region in the 1930s. Historians now see Stakhanov’s feats as carefully choreographed by the authorities as a propaganda tactic to push up norms. Admiring the paintings of miners and factory workers, Galina, a 73-year-old, recalled a rose-tinted past. “Things were better back then. It was a totally different life,” she said. But such idealisation of the Soviet era by the authorities comes with a denial of anything that spoils the rosy image. In August, the Donetsk rebel authorities decided to pull down a monument to victims of the 1930s famine in Ukraine. And Donetsk State University removed a monument to Ukrainian dissident Vasyl Stus, a poet and campaigner for national culture, who spent decades in jail and died in a prison camp in 1985 at the age of 47. “That was a criminal act,” said Maria, a pensioner – but her view seemed to be shared by few.